Style meets substance in a strikingly modern business display crafted for optimal viewing, productivity, and ergonomics. The HP EliteDisplay E243i 24-inch Monitor has a 3-sided micro-edge bezel for seamless multi-display tiling and 4-way adjustability so you can comfortably power through the day. \n\nBreak the boundaries\n- Expand your productivity with uninterrupted views of one screen or many with a 3-sided micro-edge bezel that supports virtually seamless arrays. Get crisp visuals from any angle on the 1920 x 1200 WUXGA resolution, 24" diagonal IPS screen.\n\nWork comfortably\n- Find your most comfortable, productive position with adjustable tilt, height, swivel, and up to 150 mm height adjustment settings. 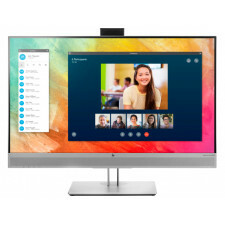 Use pivot rotation to customize portrait or landscape views when using multiple displays.\n\nExperience simple, convenient connectivity\n- Work with your most frequently-used devices with VGA, HDMI, and DisplayPortâ„¢. Connect your USB accessories right at the display with two USB 3.0 ports.